Independent journalist Sarah Abed speaks with Aramean Christians about the systematic discrimination and human rights violations they often face in the Kurdish enclaves of northern Syria. AL QAMISHLI, SYRIA (War Report) — Over the past few weeks, multiple independent on-the-ground sources have provided and corroborated information regarding disturbing events taking place in and around the Al Hassakah governorate in northeastern Syria. One of the most startling allegations made is that the People’s Protection Units (YPG) and the Syrian Democratic Forces (SDF) have been arresting and kidnapping men aged 18 to 40 in the Al Hassakah governorate, which includes Al Qamishli and other towns under their control. They are taking these men against their will to Kurdish militia training camps, where they will stay for some time and receive training before being forced to fight in the so-called “New Syrian Army” or “North Syrian Army.” I was told that some of these men are being taken to the front lines to fight in Afrin as well. Sarah Abed (SA): Can you tell me about yourself, your mission, and why you are in Syria? Eddie Gaboro Hanna (EGH): I’m the founder of Patriarchal Relief Care Australia. For the past five years, I’ve been organizing fundraising events and sending funds to our Patriarchal diocese in Damascus, to be dispersed to the neediest Christians suffering in war zones in Syria and Iraq. I’m now on my second aid mission to Syria and am working on projects such as repairing damaged and bombed homes of displaced families, in hopes they can return to their homes. I’m also aiding over 400 orphans and over 160 widows, as well as purchasing and supplying medical equipment, allowances, and supplies to ill and disabled children. I made a documentary called “Tears of Another Genocide” to help raise awareness and show the world the persecution and genocide against Christians in the Syrian war. SA: How long have you been in Syria during this trip? EGH: I’ve been in Syria for exactly five weeks now. SA: What areas have you visited during your trip thus far? EGH: I visited Damascus, Saydnaya, Maloula, Homs and villages in the province of Homs, Sadad, Aleppo, Qamishli, Hassakeh, and Khabour. SA: Did you receive protection from Sootoro or the SAA? If so in what areas? What type of protection? EGH: Sootoro, as in the Christian Sootoro, not the pro-Kurdish fake Sutoro, picked me up and accommodated me for a week in northern Syria. In every other part of Syria, I was in, which were all under the control of the SAA (Syrian Arab Army), I didn’t need any protection — only in the Kurdish (controlled) areas of Northern Syria, I needed protection. SA: Have you received any threats while in Syria? EGH: No, I haven’t received any threats. SA: Has your life ever been in danger while in Syria? If so where, why, and by whom? EGH: Yes, my life was in serious danger New Year’s Eve in the Christian town of Bab Toma. I was outside among thousands in a crowd celebrating New Year’s Eve and at exactly 12:02, just past midnight, the Free Syrian Army started firing mortar shells and one landed approximately 30 to 50 meters from me killing two Christians that night. SA: What do Syrians want foreigners to know about the war in Syria? EGH: Syrians want the foreigners to know that it was never a revolution nor a peaceful protest, because in 2009, two years before the war, the terrorists started digging tunnels and stashing massive arms preparing for this brutal war. SA: What are some of the complaints you’ve heard from Syrians? EGH: Non-Kurds are treated as second-class citizens by the Kurds. They are forced to pay special taxes simply because they are non-Kurds. Christian homes have been confiscated. Kurds write on the homes that this property now belongs to the Kurds, exactly like how ISIS writes on homes they take. Syrians complain more about America and the Kurds than anything else. America funded the opposition who started the war and destroyed over a hundred thousand Christian homes, and they’ve also funded the Kurds, who are oppressing the non-Kurds and even some Kurds who disagree with their political ambitions. Local Christian sources, fearing for their lives and speaking on condition of anonymity to the World Council of Arameans (WCA), report that they are facing more and more harassments from the Kurdish YPG and Asayesh (security forces). On Friday, 19 January, the first grave human rights violations of the new year included the abduction of seven Christians — four Armenians and three Arameans (otherwise known as Syriacs). Nevertheless, following intense negotiations, all of them were released except for the 20-year young Aramean, Saliba A., who was snatched in daylight out of his shop in Qamishli by the Asayesh. Eddie and Qamishli resident Samer, a reliable local source, provided me with further insight into on-the-ground conditions and human rights violations they witnessed in Syria. These included soaring real-estate prices as wealthy Kurds buy up as much property that they can get their hands on, often paying the owners double the property’s value. The Kurds are able to offer more for these properties due to illegal control of Syrian industry – including the oil, transportation, financial sectors — imposing unlawful taxes, and charging fees for everyday things such as renewing licenses or carrying out normal business activities. If one wants to sell a certain good, they are directed to a Kurd who is in charge of collecting a tax on that particular good. They are doing this for almost everything and the local population is suffering as a result. Much of Kurdish culture is borrowed from Assyrians, Armenians, and Aramean culture. In fact, much of the land in Eastern Turkey that the Kurds now claim once belonged to Armenians. It is hardly surprising, then, that the Kurds assisted in the Turkish genocide of Assyrians and the 1915 genocide of Armenians. Eddie Gaboro Hanna told me: “They [the Kurdish militias] are still taking land and property from Christians by force and charging the Christian businesses a tax.” They are also destroying historical sites and claiming Assyrian artifacts to be Kurdish in origin. Historical revisionism is taking place, and the indigenous people are crying out for the world to stop these violations. Reports of ethnic cleansing have been consistent in areas controlled by the SDF/YPG, with Arab villages entirely evacuated and re-inhabited by Kurdish settlers. 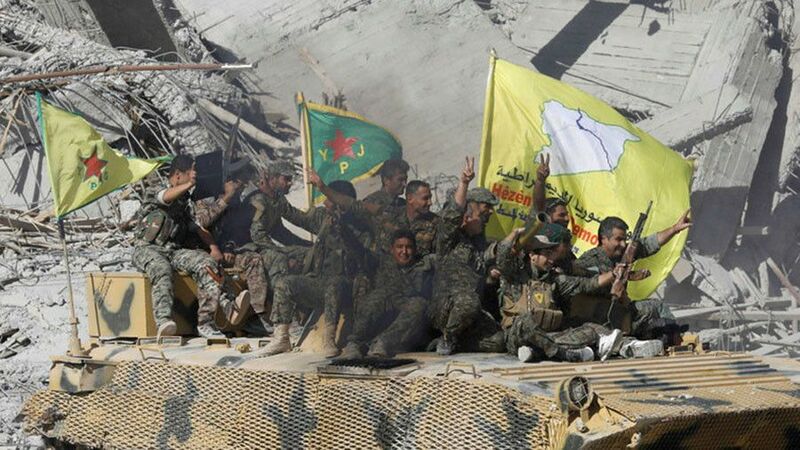 In the most recent case, … Tabqa, a city made up primarily of Arab Sunnis and a small Christian Assyrian minority, has seen SDF tyranny continue since they captured the site from ISIS in May 2017. Houses that were emptied by people escaping the fighting and SDF rule have seen their houses confiscated and taken over by the SDF-controlled Tabqa Council. Kurdish independence has been falsely portrayed as an ethnoreligious, democratic, feminist, revolutionary cause by mainstream and even some alternative media outlets. However, these media sources completely ignore facts and realities that contradict the romanticized version being publicly displayed. A point they often disregard is that the Kurds are not the original inhabitants of the lands that they now claim. Assyrians, Aramaeans, Armenians and other Christian minority groups are indigenous to the Levant. Aramaic, the language spoken by Arameans, dates back 3,000 years and is the language that Jesus Christ spoke. Many members of the Syriac Orthodox church still speak Aramaic and it’s an important component of their religious liturgy. A popular misconception that is regularly touted by Kurdish sources is that they are the largest stateless group of people in the world. However, that title belongs to the Tamil people, an ancient ethnic group in South Asia who mainly reside in India and Sri Lanka. With a population of over 79 million, the Tamils are double the size of the Kurdish population. Their written history dates back 2,000 years. The conflict in Syria has brought to light the reality that Kurdish terrorists threaten the sovereignty and territorial unity of both Turkey and the Syrian Arab Republic. It has been well documented that on Syrian territory, [in] the illegal Kurdish regime of “Rojava,” Arabs are particularly discriminated against. Arabs are often forced to pay extremely high prices for basic goods, which are sold cheaply to local Kurds. Human rights violations and blatant discrimination against non-Kurds and even some Kurds by Kurdish militias and Kurdish security forces need to end. Samer told me that his best friend is a Syrian Kurd and is staunchly opposed to the notion of a Kurdish federation or autonomy in Syria. Due to his repeated vocal opposition to any plans to weaken and divide Syria, Samer’s friend has received threats to immediately cease his public opposition or he will be forced to leave Al Qamishli. His family received visitors that relayed the same message. Speaking up against Kurdish militias has become a very dangerous act for Kurds and non-Kurds alike. Syrians will not accept the formation of a federalization and are patiently awaiting political negotiations to take place. As I stated in a previous article, Kurds throughout the Middle East have vigorously pursued their goals through a multitude of groups. While some Kurds established legitimate political parties and organizations in efforts to promote Kurdish rights and freedom, others have waged armed struggles. Some, like the Turkish PKK, have employed guerrilla tactics and terror attacks that have targeted civilians, including their fellow Kurds. For the United States, the Kurdish cause has always been a ploy in order to carry out its formidable foreign interventionist strategy. Without its Kurdish “allies” the United States would not be able to establish its illegal military bases and thereby have a presence in the region. The northeastern region of Syria is the most oil/gas and agriculturally rich region in the country, which adds to its significance and geopolitical importance. In addition to fueling perpetual war and conflict in the Middle East, the U.S. is using its strategic presence to assist its number one regional ally, “Israel,” and to keep an eye on its proclaimed adversary, Iran. With its plans exposed, anyone who still believes the U.S.’s claims of foreign intervention due to humanitarian motives is being willfully ignorant of the hard facts. Sarah Abed is an independent journalist and political commentator, covering a broad range of issues relating to the Syrian war, Kurdish issues in Iraq and Syria, as well as U.S policy in the Middle East. She appears frequently in international media and speaks at universities. See more of her work at her personal blog: The Rabbit Hole. Article published on Mint Press News on February 12th, 2018. Great piece. Love the work you are doing, keep shining a light on the lies that the western media is spinning about what really is going on in Syria. Hopefully one the day the truth will set the world free. Thank you Simon! I greatly appreciate the encouragement.